Where is the suprachiasmatic nucleus? 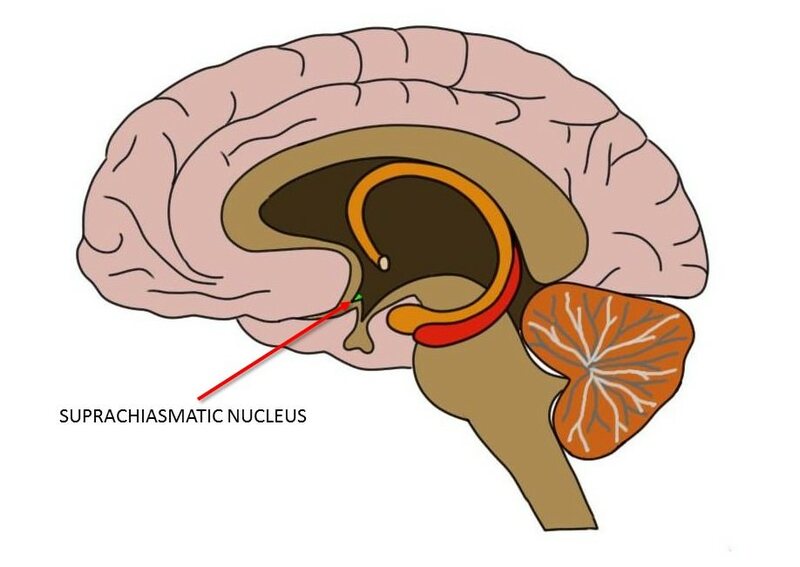 the suprachiasmatic nucleus is represented by a small green area within the hypothalamus (indicated by red arrow). The suprachiasmatic nuclei are two small, paired nuclei that are found in the hypothalamus. Each suprachiasmatic nucleus only contains approximately 10,000 neurons. The nuclei rest on each side of the third ventricle, just above the optic chiasm. The location provides the rationale for the naming of the structure, as supra means above and chiasmatic refers to its proximity to the optic chiasm. What is the suprachiasmatic nucleus and what does it do? Circadian rhythms are biological patterns that closely follow a 24-hour cycle. The term circadian comes from the Latin for around (circa) and day (diem), and circadian rhythms govern a large number of biological processes including sleeping, eating, drinking, and hormone release. In the 1960s, researchers noticed that damage to the anterior hypothalamus of the rat caused a disruption in the animal's circadian rhythms. Several years later, the specific nucleus in the hypothalamus whose integrity was necessary for maintaining circadian rhythms was identified as the suprachiasmatic nucleus. Watch this 2-Minute Neuroscience video to learn more about the suprachiasmatic nucleus and the molecular clocks it contains. We now know that the suprachiasmatic nucleus houses a type of biological clock that is able to keep our circadian rhythms on close to a 24-hour cycle, even without the help of external cues like daylight. Thus, if you were to lock someone in a room with no external light and no other way of telling the time, her body would still maintain a circadian rhythm of around 24 hours. The mechanism that regulates this biological clock was first elucidated in Drosophila, more commonly known as the fruit fly. In Drosophila, the timekeeping of the circadian clock appears to be controlled by a cycle of gene expression that has an ingenious negative feedback mechanism built into it. Cells in the suprachiasmatic nuclei of Drosophila produce two proteins called Clock and Cycle. Clock and Cycle bind together and act to promote the expression of two genes called period (per) and timeless (tim). The protein products of the per and tim genes, Per and Tim, then bind together and proceed to inhibit the actions of Clock and Cycle, an action which in turn suppresses the production of Per and Tim. As the sun rises, however, the Per and Tim proteins begin to break down. When Per and Tim degrade fully, Clock and Cycle are free to act again; they go back to promoting the expression of per and tim, starting the cycle anew. The process consistently takes around 24 hours to complete before it repeats. Thus, it is thought that this cycle of gene expression is what acts as the molecular clock in Drosophila suprachiasmatic nucleus cells. This understanding of the timekeeping mechanism in Drosophila laid the foundation for elucidating the process in mammals, where it is thought to be similar but more complex. The mammalian version of Cycle is called BMAL1 (which stands for brain and muscle ARNT-like 1). When CLOCK and BMAL1 bind together, they enhance the transcription of multiple period (Per1 and Per2) genes and multiple genes known as cryptochrome (Cry1 and Cry2) genes. The resultant PER and CRY proteins form complexes along with other proteins to inhibit the activity of CLOCK and BMAL1 until the PER and CRY proteins degrade (as above). We know that this process of gene expression and inhibition acts to keep a 24-hour clock within the neurons of the suprachiasmatic nucleus, but less is known about how the timekeeping within these neurons leads to the regulation of rhythmic activity throughout the body. It is believed, however, that the molecular clocks found within the neurons of the suprachiasmatic nuclei regulate neural activity within the nuclei, which in turn coordinates the activity of multiple signaling pathways as well the stimulation of projections to neuroendocrine neurons in the hypothalamus involved with hormone release. Additionally, the suprachiasmatic nucleus helps to maintain circadian rhythms by coordinating the timing of billions of other circadian clocks found in cells throughout the rest of the brain and body. Not long after the discovery of the suprachiasmatic nucleus, it was also learned that similar types of molecular clocks exist in most other peripheral tissues and in many areas of the brain. These clocks, sometimes called slave oscillators (while the suprachiasmatic nucleus is considered the master oscillator) appear to depend on signals generated by the suprachiasmatic nucleus to synchronize their time-keeping with that of the suprachiasmatic nucleus. These signals can be associated with rhythms that the suprachiasmatic nucleus helps to establish, like feeding patterns, rest and activity behaviors, etc., or by direct neuronal or hormonal output from the suprachiasmatic nucleus. Although the suprachiasmatic nucleus is capable of maintaining circadian rhythms independently of any environmental signals (e.g. daylight), it does rely on cues from the environment to make adjustments to the circadian clock. For example, when you fly across multiple time zones, your body's circadian clock becomes significantly out of sync with the timing of the day (e.g. your body might be preparing for sleep when it is still light out). To make adjustments to the circadian clock in such instances, the suprachiasmatic nucleus relies on information it receives from the retina about light in the environment. Such information travels from the retina to the suprachiasmatic nucleus along a path called the retinohypothalamic tract. Additional inputs to the suprachiasmatic nucleus provide more information about light in the environment and other non-photic information about time of day to help to adjust the circadian clock. Due to the importance of our circadian rhythms to normal functioning, the integrity of the suprachiasmatic nucleus is essential to health. Disrupted function of the suprachiasmatic nucleus is being explored as a potential influence in a variety of psychiatric disorders as well as a factor in age-related decline in healthy sleep. Thus, although we have much more to learn about the suprachiasmatic nucleus, it is clear that it plays a very critical role in healthy brain and bodily function. Colwell, C. (2011). Linking neural activity and molecular oscillations in the SCN. Nature Reviews Neuroscience, 12 (10), 553-569. Dibner, C., Schibler, U., Albrecht, U. (2010). The mammalian circadian timing system: organization and coordination of central and peripheral clocks Annual review of physiology, 72 (1), 517-549.